This workshop led by Margot Henderson and Susanne Olbrich is an invitation to explore the theme of "Homecoming" and what it means for everyone of us. Creative writing and music improvisation will be sources of inspiration and means of expression at the same time. Gentle movement practices facilitate coming home to the body and moving from DOING to BEING. We become receptive for music and words to emerge. Margot and Susanne encourage experimentation, aiming to inspire confidence in your own voice and creative process. Everyone welcome — no previous experience in music or writing necessary! Please bring along musical instruments, pen and paper. Margot Henderson is a poet and storyteller, singer and songwriter. She has been working as a community artist for the last 20 years with people of all ages, abilities and cultural backgrounds, creating arts events and performances. For many years she lived in London where she worked as Arts Educator for the Tate Gallery. Margot has performed widely with Apples and Snakes, The Big Word and other companies. Since returning to Scotland in 2002 she has worked with a wide range of community groups and organisations. She was Storytelling Fellow for Aberdeen and Writer in Residence for the Cromarty Arts Trust. 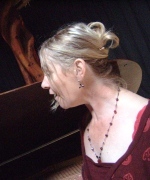 Susanne Olbrich is a pianist, composer and music teacher living in Findhorn, Moray. She trained at Oldenburg University (Germany) and in 1992 received a BA (1st class hons) degree in music. In her original music Susanne's classical training combines with a wide range of influences, such as tango, world music, contemporary jazz and minimal music. Susanne has performed widely, both as soloist and with various ensembles. She has been offering workshops in Germany and Scotland, collaborating with music schools, the NHS, adult education providers and community groups.